Susan Brown married Deacon Henry Houghton, son of Major Jonathan Houghton and Rachel Hale, w/2. 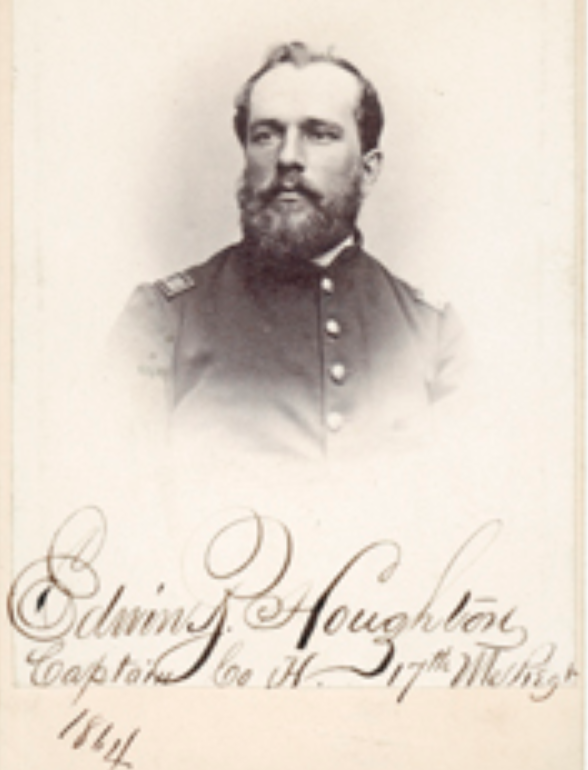 Maj. Edwin Brown Houghton married Eliza B. (?) in circa 1878 mar 32 y in 1910 census. Death Jul 22, 1874 a. 86 y. 8 m. 19 d.
Artemas Fairbanks and Rachel Houghton declared their intentions of marriage on Dec 22, 1815 Harvard, Worcester Co., MA, USA. Artemas Fairbanks married Rachel Houghton, daughter of Major Jonathan Houghton and Rachel Hale, in Jan 25, 1816 at Waterford, Oxford, ME, USA. Stephen Nourse married Sally Houghton, daughter of Major Jonathan Houghton and Rachel Hale, in Oct 22, 1820. Levi Howard married Mary Houghton, daughter of Major Jonathan Houghton and Rachel Hale, in Apr 2, 1812 at Bolton, Worcester Co., MA, USA. Abraham Whitcomb married Betsey Houghton, daughter of Major Jonathan Houghton and Rachel Hale, at Waterford, Oxford, ME, USA. Leonora Thorpe married Lt. Cyrus Houghton, son of Major Jonathan Houghton and Rachel Hale. H. Daniel married Harriet H. Houghton, daughter of Major Jonathan Houghton and Rachel Hale. Mary Ann Nourse married Dr. Lewis Willard Houghton M.D., son of Major Jonathan Houghton and Rachel Hale, in Aug 1, 1833 at Harvard, Worcester Co., MA, USA, MLM: Waterford. Esther T. Weston married Dr. Lewis Willard Houghton M.D., son of Major Jonathan Houghton and Rachel Hale, in Jan 4, 1842 at Otisfield, ME, USA, w/2. Susan Henrys married Dr. Lewis Willard Houghton M.D., son of Major Jonathan Houghton and Rachel Hale, w/3. Sampson Haughton married Mary McGregor. Henry Haughton married Joanna Townsend in Dec 31, 1801 at Montgomery Co., NY, USA. Richard Houghton married Rebecca Hewett in 1819. Lucy Houghton married Abel Hadley w/1. Lucy Houghton married Levi Knowlton w/2. Sally Houghton married Mr. (?) Griffon. Ezra Houghton married Sally R. (?) problem marriage. Rebecca Hewett married Richard Houghton, son of Capt. John Houghton and Mary Allen, in 1819. Abel Hadley married Lucy Houghton, daughter of Capt. John Houghton and Mary Allen, w/1. Levi Knowlton married Lucy Houghton, daughter of Capt. John Houghton and Mary Allen, w/2.